It is a normal 4 door sedan however it actually carries 6 people: 3 seated across the back seat and 3 across the front. Yep, who needs a handbrake when you can place a cushion over it and call it another seat. 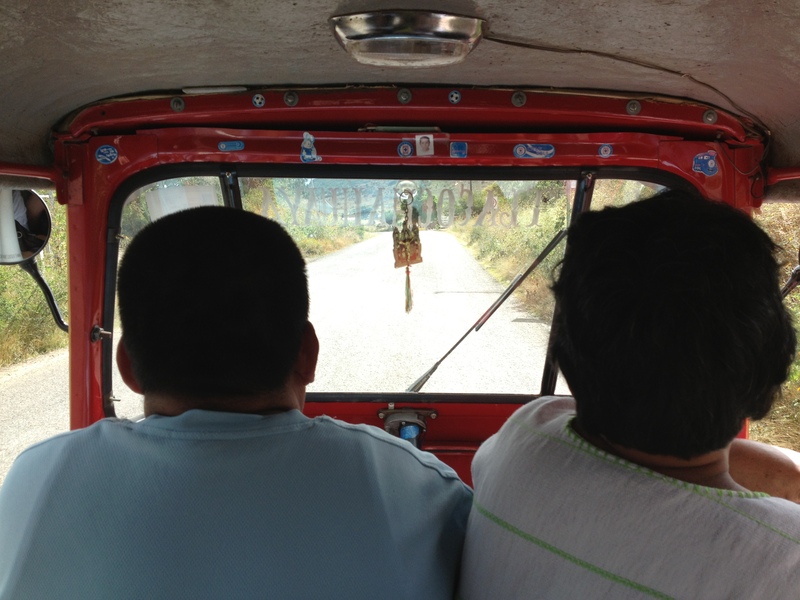 Contrary to normal wisdom, in Oaxaca you scramble for a seat in the back when a colectivo pulls up. No one actually chooses to sit in the front unless it’s the only place left, or you naively thought that the driver wouldn’t possibly find another fare before you reached your destination meaning you could have the front seat to yourself in a rare find. If you are unfortunate and manage to get the shared front seat, you get to stare at the destination written on the windscreen in reverse your entire journey whilst also clocking the speedo and counting how many cars you have managed to pass on the way. Because I am taller than the average Mexican, my view in the front seat consists of trying to look under the darkened sun strip at the top of the windscreen – so I end up with a lovely angle of the car’s bonnet. If you have long legs, there is also the chance the driver will not be able to get to 4th gear, based on the fact you cannot move your leg even the couple of centimetres required for a gear change – ensuring the car stays in high revs in a lower gear – and making the trip all that more interesting. Your seatmate and you are held in the car only by the strength of the door locks, and you are welded together by awkwardness, a lack of room to disentangle yourselves and sweat. Oh, and you cannot use the seatbelt either – not with 2 of you sharing space designed for one! Anyway, back to the colectivo: they leave from particular streets in northeast, southwest and southern areas along the periphery of Oaxaca – where you catch one will depend on where you are heading to – and so it is important to figure that out before you leave home or you face a long walk trudging to the correct departure location. Colectivo drivers want to fill their cars before they head off so will arrive at departure points and trawl past stops along the road to your destination with a hand out the window, fingers signalling how many seats are available. 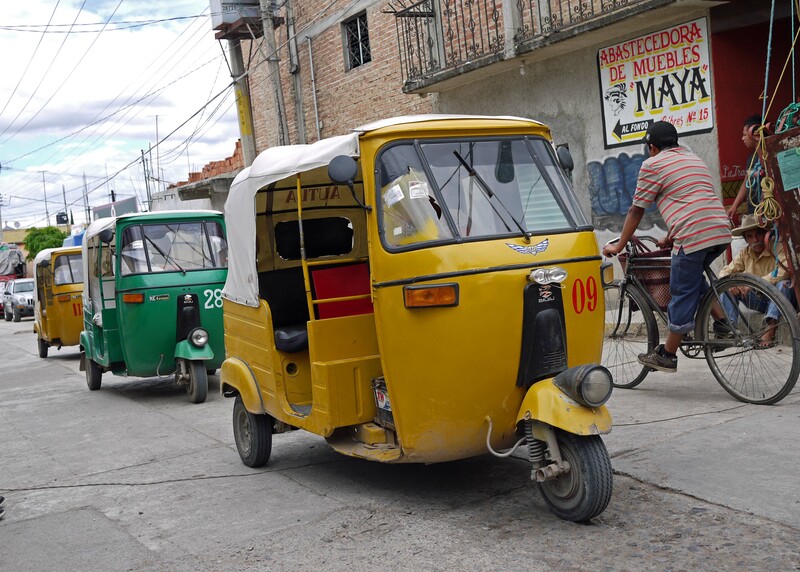 There are also 3 wheeled colectivos (I think of them as tuk-tuks, but I think they are properly called ). These vehicles are generally found by the main highway, ready to transport people from the bus stop to the local village (up to 6km away and sometimes down a dirt road). Like the sedan colectivos, you squash in with other people, but luckily because these run a motorbike engine (I guess 125cc) they cant overload them too much or they physically can’t move. Colectivos will drop off and pick up people right to their destination but generally are a pretty fast way to travel and are definitely cheaper than a taxi – about a 10th of the price, which you pay (small denominations only) when you get to your destination. I took one to the Tlacolula market in Sunday and smiled wryly when from my seat in the back, I watched the tourist in the front seat get a shock when a barrel-chested Mexican guy with 2 bags made from sugar sacks squeezed in the front with him. I am learning. I wonder whether you are biking yet? The 3 wheel colectivos look good to me to. Beats walking if you are hot and weary, right?